Jahangirnagar University is the only free residential university which is situated at Savar. This university has world rank 2801. And, to know more all the info about this university read the article below. Here, we have discussed its history, location, departments, and ranking. 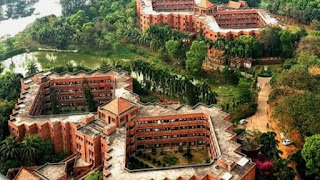 Jahangirnagar University is a public and one of the top universities in Bangladesh. This university is the only fully residential university in Bangladesh. It established in 1970. On that time, it was established by the Jahangirnagar Muslim University Ordinance of the government of Pakistan. This university is located in Savar Upazila, Dhaka, Bangladesh. The nickname of this university is JU. The first group of this university had consisted with 150 students and four departments. Those four departments were Economics, Geography, Mathematics, and Statistics. This university operated as a project until 1973. But, after then, the Jahangirnagar Muslim University Act was modified as the Jahangirnagar University Act. Now, This University has total 16,781 students. Among them, 10,983 students are undergraduates, 3,501 students are postgraduates, and 2,274 are Doctoral students. This university has total 755 academic staffs and 1,700 administrative staffs. The president Abdul Hamid is the Chancellor of this university. And, Farzana Islam is the president Vice-Chancellor and Prof. Dr. Md. Abul Hossain is the present Pro-Vice-Chancellor of JU. Now, this university has a large area which is 697 acres. And, the official link of this university is www.juniv.edu. Jahangirnagar University is a top level university in Bangladesh. This university has 6 faculties and under those faculties, it has 34 departments. The name of those faculties and departments are given below. • Faculty of Mathematical and Physical Science. • Faculty of Arts and Humanities. To admit in the Jahangirnagar University, students must apply for the admission test first. But, students must full fill all the requirements for admission test like grade points. Yes! This university has some minimum requirements of grade points for all the units. Actually, JU has total 8 units A, B, C, D, E, F, G, and H. Every unit has some minimum GPA requirements of SSC and HSC exam. The students who will have all this and get good marks in the admission test can admit here. Jahangirnagar University is one of the top universities in Bangladesh. Its rank is very good. Its rank is 5 among all the public universities of Bangladesh. This university’s world rank is 2801 among all the universities of the whole world. It is very good news for JU. Jahangirnagar University has all the facilities that a good public university could have. This university has a large campus. And, it has 8 male hostels and 7 female hostels. This university also has a mosque, transport facility, several clubs, and hi-tech labs. Its central library is very big and Wi-Fi coverage. Its library contains more than 110,000 books, 14,000 hardbound journals, and 22,000 online journals. It has good medical facilities too. Finally, we will say it is a top ranked university of Bangladesh. And, fell free to ask any question in the comment box about the Jahangirnagar University.